Dementia is the name given to a group of symptoms linked to an ongoing decline in brain function, according to the NHS. There are a number of different types of dementia, and the most common in the UK is Alzheimer’s disease. Diagnosing the condition early could help to slow down the condition’s progress. You could lower your chances of developing dementia by regularly keeping hydrated. 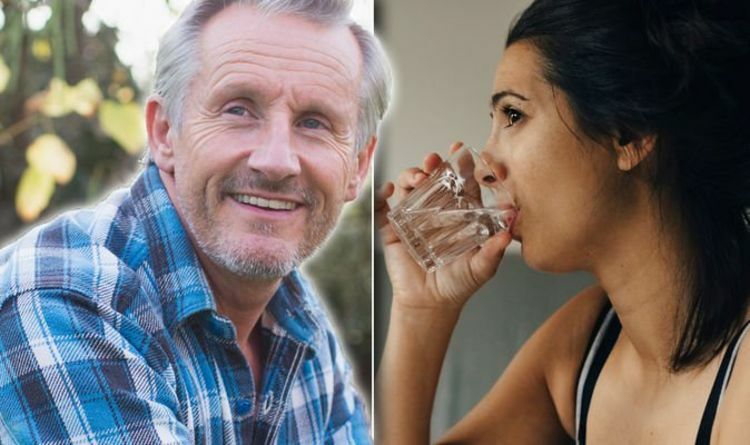 Drinking plenty of fluids could play a role in reducing your chances of developing dementia, according to the Alzheimer’s Society. Keeping hydrated – be it by drinking water, skimmed milk or sugar-free drinks – could also help to prevent some other medical conditions. Everyone should aim to drink between six and eight glasses of water every day, said the charity. “Although getting older is the biggest risk factor for dementia, evidence shows there are things you can do to help reduce your own risk. “A healthy, balanced diet may reduce your risk of dementia, as well as other conditions including cancer, type 2 diabetes, obesity, stroke and heart disease. “Eat at least five portions of fruit and vegetables a day. Limit your sugar intake, and look out for hidden salt. It’s also important to make sure you eat protein at least twice a week, including oily fish, beans, pulses, eggs or meat. Meanwhile, drinking alcohol increases your risk of developing dementia, added the charity. At the very most, aim to drink no more than 14 units of alcohol in a single week. Drinking more than that could cause alcohol-related brain damage. Doing regular exercise should help to lower your risk of dementia. Aim for around 150 minutes of moderate-intensity activity every week. Arnold Schwarzenegger Just Proved He's Still Got Conan The Barbarian Moves Star Wars 9 Rise of Skywalker: JJ Abrams CONFIRMS Palpatine return – But Sith Force ghost?